I haven't updated this blog for a VERY long time because we moved all the AntiEpic information over to Riding Gravel. If you haven't been over to Riding Gravel in some time, you should head over because there have been some big changes going on. AntiEpic 2015 - What's Up? There will be a 2015 AntiEpic and we will confirm that date soon. We may break out the long ride from the short ride. The long ride will likely stay the same weekend as it has every year. Stay tuned to the Riding Gravel "News and Reviews" section for that. Also, be sure to check back to the ride page here. So, what's up with Riding Gravel? Here's a list of what's up! I created Riding Gravel as a place to host the information, routes, etc. for the gravel events that I put on back in the fall of 2013. The rides became popular and I noticed that there were a lot of questions, comments, and general chatter about getting out and doing "gravel grinders." So, with all of that going on, I decided that it would be a good idea to cook up a small site to bring those together. The forum got more and more popular, people asked for more information, and I quickly felt that more needed to be done, so I added some more details to the site and starting sharing more information that wasn't being done elsewhere. All of it was coming together while making a effort not to step on the toes of what GravelGrinderNews.com was doing. Guitar Ted is a friend and I definitely didn't want to cut in on the great resource that he created. He had built a full gravel ride/race/event calendar that was the best place to go for anyone who did these kinds of rides and races. Additionally, he was continuing to provide helpful news and reviews of topics related to gravel and general off pavement riding. I was up late one night updating the site and all I could think about was going to sleep. I kept thinking to myself, "Why am I staying up late doing this? Why am I putting in all this work, likely scouring the same information that Guitar Ted is, and then checking his to make sure I'm not doubling up? What are readers going to do with going to two sites? What is the future of gravel grinders and all of this stuff? What am I going to do?" Then it hit me! Maybe Guitar Ted is thinking the same thing. Maybe it doesn't need to be two separate one-man shows. Hmmm... I couldn't wait to wake up the next morning and give him a call. The morning came and I called him to ask if he wanted to go 50/50, combine efforts, and make one site with all the information. To my surprise, he had similar thoughts and the rest is history. We officially announced the combination of Gravel Grinder News and Riding Gravel back on December 3 in this post. The response has been humbling. We have some great people in our corner and it's greatly appreciated. We really look forward to the future! If you want to hear me and Guitar Ted discuss all of this in a podcast, so click here for Episode 1 of the "Riding Gravel Radio Ranch"
The Gravel Event Calendar is growing daily and currently includes over 50 events for 2015 from around the country. Are you looking for a ride to do or put on a race yourself? Have a look and let your friends know! Hey race directors, we'll post your event for free, just Submit Your Race HERE. Find out what riders will be checking out in 2015 on the Event Calendar here. The Riding Gravel Forum is a great source of information about everything from tires to frames to places to ride and races to race. The discussion continues to get broader and more interesting as more people join in. There are currently, as of today, 591 members and 1715 posts. Check out the forum here. The News and Reviews section is the place that you'll find out about things going on in the world of gravel grinders, gravel rides, and any other mixed or non-paved surface riding. Guitar Ted will provide reviews of products and we may have contributors checking in occasionally as well. Check out the News and Reviews section here. As mentioned earlier, we will be doing a regular monthly podcast about gravel/offpavement/whatever terrain topics called the "Riding Gravel Radio Ranch." It will include interviews with guests, recaps of what's up on the website, and discussion about whatever is going on in the world of gravel riding. It's fun to do a different take on a cycling podcast and it should be interesting to see where it goes. Stay up to date on the podcast, by checking back on the Riding Gravel Radio Ranch podcast homepage here. Please go to Riding Gravel's AntiEpic page for all of the information. There you will find all of the course information, details, picture, and everything else. Both the AntiEpic 50 and 160 will be moving over to RidingGravel.com. Stay tuned to Riding Gravel for more information soon! Meanwhile, head over to the only off-pavement/gravel - specific forum, The Riding Gravel Forum. Guitar Ted is back on the air with another new episode. GT and co-host, Ben, just released another episode of "The Guitar Ted Show" on Mountain Bike Radio. In this episode they discussed some hot cycling topics from this year's Interbike; fatbikes, 27.5, and GRAVEL! 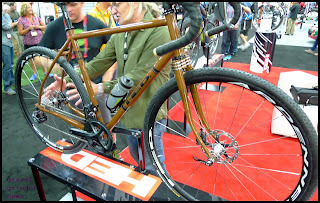 There has been a pretty big ongoing discussion about "gravel" bikes lately, including a healthy set of posts and comments over at Guitar Ted's blog. Guitar Ted brought up a very good point - the term "gravel bike" could be and, from our point of view, is limiting to this style of bikes. A reader also touched on it in saying that these are the style of bikes that most people should probably be on. Not the race inspired, light-as-a-feather, laterally-stiff-vertically-compliant, TdF machines, that most are looking at for road. It seems that, for a large part of the population, they are looking to get their asses on some more comfortable and functional bikes. This is apparent in the recent adoption of "endurance" road bikes for the roadie crowd. Further, there is a large group of cyclists who care more about their ride around the bike path to get in shape than shaving their legs and sharing their Strava results and they have been buying recreational/fitness bikes (I prefer upright road bike, so people don't get the idea that it's a 35 pound old grandma bike) in droves. The bikes being used for gravel "grinding" are a great mix of comfort, performance, and function. Riders can put their wider tires on for normal, everyday riding, and then switch out to the skinny skinnies if they want to head out on the big century of the summer. Anyhow, they discussed all this in the new episode, so go have a listen to the episode and you can hear Guitar Ted's take on the situation. What is FRG and why would you care? Front Range Gravel is the beginning of a gravel community with several rides throughout Colorado's Front Range. In it's early stages right now, it's two rides - the Pedal 50 on October 5th and the Greenland Gravel Grinder on October 19th. There are some talks about some others in the works, so we'll see if those come to fruition this fall or if they are in the cards for 2014 instead. While it's been brewing in the background, "gravel grinding" has hit mainstream. Several companies have released "gravel bikes" and the ride/race calendar around the country has exploded. Gravel Grinder News has the full gravel event calendar. Colorado, especially the Front Range, seems to have overlooked the riding opportunities east of I25. Perhaps it's due to all the other great riding or just not being "a thing" or something else....we're not sure. But, that's about to change. 100's of miles of lightly traveled gravel roads with rolling hills and spectacular views of Longs Peak, Mt. Evans, and Pikes Peak just beg to be explored. That's the goal of FRG - help you explore and share another fantastic aspect of life in Colorado. You may care because the AntiEpic 50 will be part of the series. We've been happy to have a committed group of crazies the last two Aprils who have gutted out 160+ miles of gravel riding and are looking forward to bringing more of it all together. Want to get involved with FRG? If you have any questions, ideas, want to put on an event, need help putting on an event or want to get your company's/shop/product/service's name associated with Front Range Gravel, shoot an email to info@getoutsideradio.com and we'll see what we can help you with. Also, don't forget to mark your calendars for April 5th, 2014 for the AntiEpic 50 and 160 Gravel Grinders! There was interest in shorter routes and this is it. 51+ miles. Same day as the biggun. It's here. It's limited. Get in now. Also...the Pedal Gravel 100 ride has been changed and will likely be 50-ish miles and part of a series coming soon. The idea has been conceived. From the evil gut of the AntiEpic, a kinder, less harsh version has been born. Details will remain sparse at the moment, but stay tuned. A 100-miler and 50-miler may be coming soon to the same area. Go to RidingGravel.com for all of your ride information.